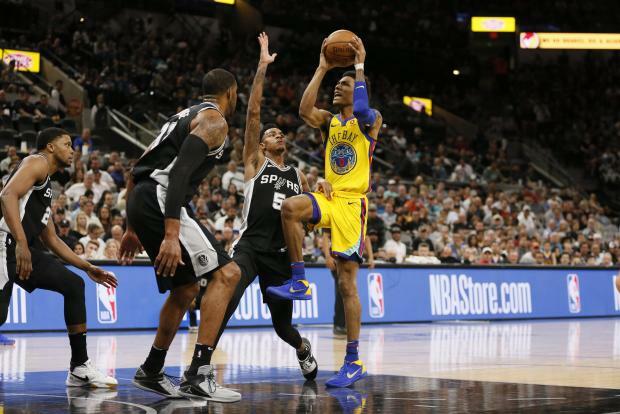 LaMarcus Aldridge took advantage of the absence of Golden State Warriors defensive ace Draymond Green to score 18 of his game-high 33 points in the fourth quarter Monday night, lifting the San Antonio Spurs to an 89-75 victory at AT&T Center in San Antonio. The Spurs' fourth straight win came after Green was inadvertently kneed below the belt by Danny Green in the second quarter, forcing him to the sidelines for the rest of the game with what was labeled a pelvic contusion. X-rays taken at the site were negative. With Draymond Green joining fellow All-Stars Stephen Curry, Klay Thompson and Kevin Durant out of action, the Warriors rallied from a 16-point deficit to take a 63-61 lead into the final period. The Spurs held the Warriors to 12 points in the final 12 minutes. Golden State's 75-point total was its lowest of the season. LeBron James recorded his 16th triple-double of the season as host Cleveland bested Milwaukee. James scored 40 points on 16-of-29 shooting and added 12 rebounds with 10 assists. Kevin Love started and scored 18 points with seven rebounds in his first action since breaking his wrist in a Jan. 30 game against Detroit. Giannis Antetokounmpo led Milwaukee with 37, and Khris Middleton added 30. The Bucks shot 51.1 percent from the floor and made 8 of 31 3-pointers but were outrebounded 42-32 and had no answer for James. James Johnson scored 10 points in the second overtime to lead Miami past visiting Denver. With the teams tied 131-all after the first overtime period, Johnson hit a layup, two treys and a dunk to lift the Heat to the win in their highest point-total game in franchise history. Johnson finished with a team-high 31 points. Kelly Olynyk had 30, Wayne Ellington 23 and Josh Richardson 17. Denver was led by Nikola Jokic with 34 points. Wilson Chandler had 26, Jamal Murray 23 and Will Barton 22. Miami's win coupled with Milwaukee's loss in Cleveland moved the Heat into seventh in the Eastern Conference playoff race, a half-game ahead of the Bucks. Joel Embiid scored 25 points and grabbed 19 rebounds to carry host Philadelphia past Charlotte. Though Embiid committed nine turnovers, he recorded his fourth straight double-double and his team-leading 37th of the season. Embiid also became the first Sixer to come up with at least 20 points and 19 rebounds in consecutive games since Charles Barkley in 1991. Ben Simmons had a triple-double consisting of 11 points, 15 assists and 12 rebounds. Simmons has dished out at least 10 assists in 19 games this season. Myles Turner scored 21 points and Victor Oladipo added 20 to power Indiana to victory over Los Angeles in Indianapolis. Turner, who made 9 of 15 shots, had missed the previous game with a left ankle sprain. Turner added seven rebounds. Oladipo hit 8 of 15 from the field. Rookie forward Kyle Kuzma was high for the Lakers with 27 points, making 10 of 18 shots. Brook Lopez scored 23 on 10-of-15 shooting and Julius Randle added 21 points and a team-high nine rebounds for L.A. Kuzma and Lopez each had eight rebounds. Blake Griffin posted 26 points, nine rebounds and seven assists to help Detroit knock off host Sacramento. Ish Smith scored 18 points, Reggie Bullock added 17 and Andre Drummond collected 16 rebounds and blocked three shots as Detroit won for just the fourth time in the past 17 games. Anthony Tolliver scored 12 points, Stanley Johnson added 11 points and three steals and Luke Kennard had 10 points. Buddy Hield scored 20 points for the Kings, who fell for the fourth time in their past six games. De'Aaron Fox tallied 16 points, Justin Jackson added 15 and Skal Labissiere had 10. A resurgent Tim Hardaway Jr. had 22 points to lead New York to its first back-to-back wins since late January with a victory over visiting Chicago. Hardaway, who went through a cold streak in early February, topped 20 points for the fifth time in eight games (with 19 points in two of the other games), going 7-for-15 from the field with four 3-pointers. He had 17 of his points in the third quarter, when the Knicks broke the game open. Cristiano Felicio had 17 points and Antonio Blakeney and Bobby Portis both had 16 off the bench to lead the Bulls, who were without three of their most important players -- Zach LaVine, Kris Dunn and Lauri Markkanen -- as they lost for the third time in four games. Reserve Caris LeVert and Allen Crabbe scored 22 points apiece as Brooklyn held on to defeat visiting Memphis. LeVert produced his sixth game with at least 20 points while Crabbe posted his 13th showing of at least 20 points as the Nets won consecutive games for the first time since beating Miami and Detroit Jan. 19-21. DeMarre Carroll added 18 points while Rondae Hollis-Jefferson contributed 16 points and 12 rebounds for his 10th double-double of the season. D'Angelo Russell chipped in 14 on a night when he missed nine of 10 3-point attempts. Andrew Harrison led seven in double figures with 19 points for the Grizzlies, who lost their 15th straight road game.